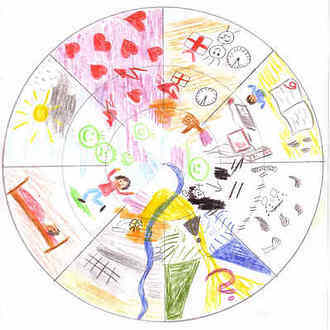 Summary: using the rosette picture as a collage, a specific subject can be taken up and highlighted. The picture can be used as an introduction to this subject. This is a picture that is drawn from the outside in. The outer circle (number 1) can be created by each person individually- participants should not look left or right and should definitely not draw in someone else’s field. Once field 1 has been painted, then one can move onto field number 2. In this field you can look to see what the others have painted and it also does not matter if you paint into/overlapping someone else’s field (demarcated by line 4). With ‘field’ number three, there is no longer a ‘field’ rather everyone can continue to paint without disturbing others. In addition, a subject can be ‘deepened’ without overwhelming people – each person can do as they please. The rosette picture is always done with a theme in mind here for example “Who did things go throughout the week?” From Monday on the outside, to Sunday on the inside. Before the picture is painted, it is necessary to give a precise explanation to the children. It is not recommended to show any previous examples of pictures as this can influence the children too much. After the picture has been painted, there are several possibilities of how to analyse it. The group leader talks about their picture and creates a prayer out of it. Everyone talks collectively about what was painted and link it to the subject of devotion and prayer. A third person comes into the room after the picture has been pained and attempts to interpret it.